Many thanks to Emily Barnes, our Chief HT scorer, for preparing these so quickly despite being away from the competition for most of the day – helping to run our Mini-Camp – and also for drafting in most of the rest of her family to ensure it all went without a hitch. Many thanks also to all other officials, volunteers, helpers etc. for ensuring that we had a splendid day and to the King family for making sure the infrastructure was so well presented and worked. Thanks also to all you competitors, your parents, branch officials, family and friends for taking part so cheerfully – despite the 1.2 mile trip to the XC course. We were glad to see you all and look forward to inviting you back to Somerford again – should we ever get the chance. I am very happy to say that the sun is still shining here in Somerford (in between the rain showers) and all is well. I attach a copy of the 2016 programme – we will not be printing a copy this year in view of the reduced numbers competing so if you feel you will need any information for the day, please print it at home and bring it with you. I would draw particular attention to the cross-country times, speeds and distances chart at the end of the programme. I attach a copy of the site layout plan (26 acre Map 2) and ask you to note that the closest postcode for the entrance to the event is CW12 4SN. If you are travelling from the M6/Holmes Chapel direction on the A54, you will pass the main entrance to Somerford Park Farm on your left-hand side. Continue along the A54 for 7/10ths of a mile and you will see the warning sign for the entrance which is on your left. Turn into the field gate (it is 14ft wide so ensure you make a wide enough turn) and continue straight for about 150m and then turn right into the main lorry park. If you are travelling from the Congleton direction, the field gate entrance is on the right about 7/10ths of a mile after you pass the Chelford Road/Sandy Lane off-set crossroads. Please take extreme care when negotiating the entrance, slowdown in good time, beware overtaking traffic – it is a single carriageway main road, it is unlikely to be very busy but needs extra vigilance. On-site – dogs MUST be kept on leads. Please beware children and horses when manoeuvring. 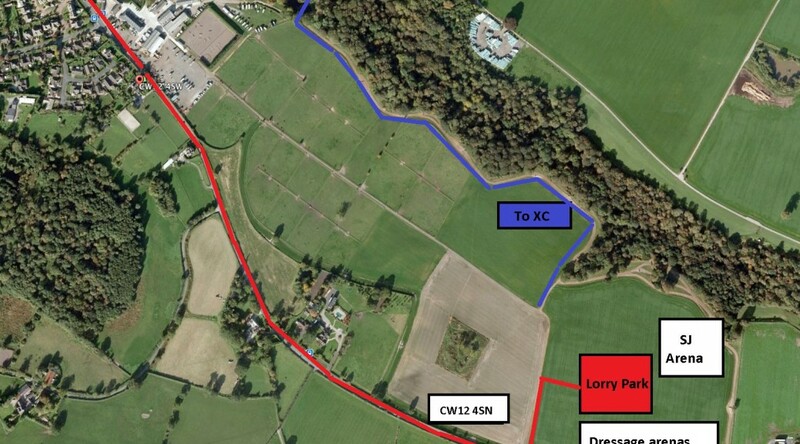 Please note the blue line on the site plan marking the route to the XC. It is 1.2 miles and you should allow AT LEAST 20 minutes to walk it. The route will be marked with direction arrows. The course will not officially be open for walking until 2 p.m. on Saturday. If you choose to walk before then, it will be at your own risk. It is currently flagged but it is possible that changes have to be made. If you wish to walk before 2p.m. on Saturday, you should seek permission from the Somerford Park office. Course maps are attached as a rough guide only – you should take account of what is actually there on the ground rather than merely following the map. I attach an updated competitor times list. There are a few changes since first publication but your times should only have changed if you or your team manager has asked to make a change for any reason. However, please check your times and use this list for future reference. We have a total of 17 teams competing across the two Areas. I attach a list of teams for your information. We will have some very special souvenirs on sale – hoodies from the 2016 Cheshire Shield that never was – they will become a collector’s item – please buy one and support the North West Air Ambulance. I look forward to seeing you all on Sunday – and just keep smiling whatever. Junior – Freddie Ashworth, Hamish Peffers, Orla Stott, Keeva Stott, Annabel James and Ella Booth. A big well done to all of them and I hope they are all looking forward to competing at Bishop Burton in August. Warwick once again put on fantastic courses for our younger members so that minis, tadpoles and tiddlers all had their own competitions. A further fifteen Area 5 members took part in these classes, with some excellent results. A special mention should go to Beatrice Taylor who beat 19 other mini girls to win her class. As well as a thoroughly enjoyable competition many of the riders camped on the Saturday night and joined in the Area 5 (and friends) barbecue. Thanks to all those who provided the facilities for this – gas barbecue, fire pit, tables and chairs as well as the food, drink and company; what more could we want? Update to competitors who have entered (and remain entered!) 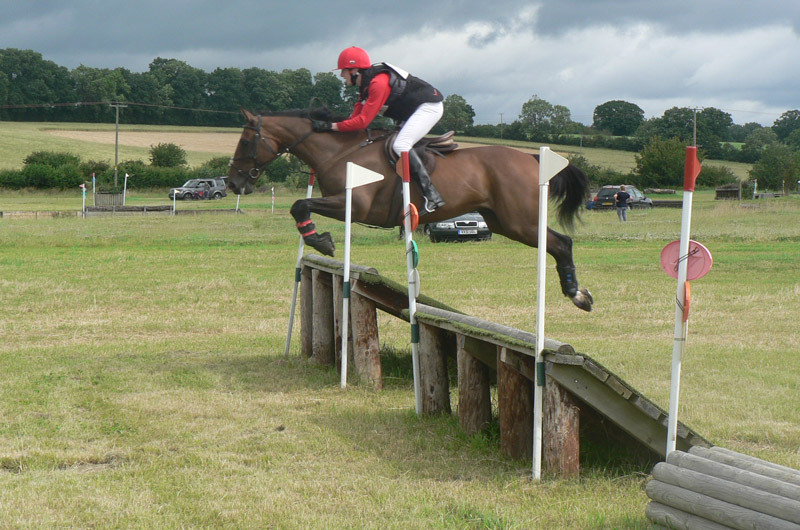 for the re-arranged Areas 4 and 5 Horse Trials to be held at Somerford Park Farm on Sunday the 24th July. The ground conditions on the Cross Country course at Somerford are improving. We had rain for most of yesterday but today has been very warm and sunny. We are forecast to have reasonably good weather from now until Sunday with the exception of Wednesday which is forecast to have thunderstorms. The course will be inspected again on Wednesday and I expect to issue a further bulletin thereafter. It may be that, even if the XC course is not usable (unlikely we hope), we will decide to proceed with a two phase competition in the expectation that HQ will allow qualifiers from that competition to take part at the Championships. It has been pointed out to HQ that, according to the PC website, members could enter the so-called “Elite” (non-qualifying) Eventing competition at the Championships without proving any experience whatsoever and therefore we can see no justification for any such requirement for the qualifying competition. We will do our best to keep you informed. We will be using the Area Eventing dressage tests as per the schedule and, except in the most exceptional circumstances (none recorded to date), commanders will not be allowed. This is, of course, only of relevance to those Area 5 competitors who are also doing the Area 5 Dressage competition at the same venue on the same day. We are liaising closely with our colleagues at Cheshire Hunt North who are organising the Area 5 Dressage to ensure there are no time clashes and as much time as possible is allowed between tests. 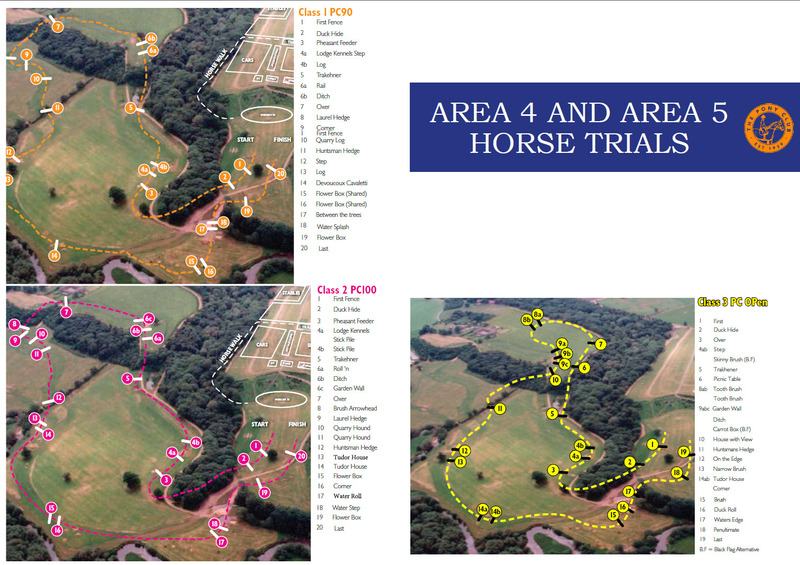 Note – there will be 7 dressage arenas altogether – 5 for the Area 5 Dressage and 2 for the Ares 4 & 5 Eventing – make sure you know which arena you are in for which test. As indicated above, we are only using two dressage arenas for AE and therefore the SJ arena will have far less riders than usual feeding in. Please ensure you get to the Arena as soon as possible and we will get you in as soon as we can. The Arena will be quite close to the dressage arenas. You should be aware that the XC start is just over a mile from the parking area, which will be adjacent to the dressage and SJ arenas. It will be signed. A horse will walk at about 4 miles per hour so you should allow AT LEAST 20 minutes to walk to the XC warm-up area. You will be given at least one hour between your SJ and XC times (1hour 20 minutes for the Novice class) so please use it wisely. The walk is mostly on sand tracks but there are some short hard-core tracks also. We suggest you do not stud-up until you reach the XC start field. Please note, we will be using an entrance which is adjacent to the main parking area NOT THE SOMERFORD PARK FARM main entrance. This entrance (a 14 foot field gate) is just over half a mile south of the main SPF entrance on the left hand side as you travel toward Congleton from junction 18 of the M6 through Holmes Chapel – use postcode CW12 4SN not the usual SPF postcode (CW12 4SW) for Satnavs. 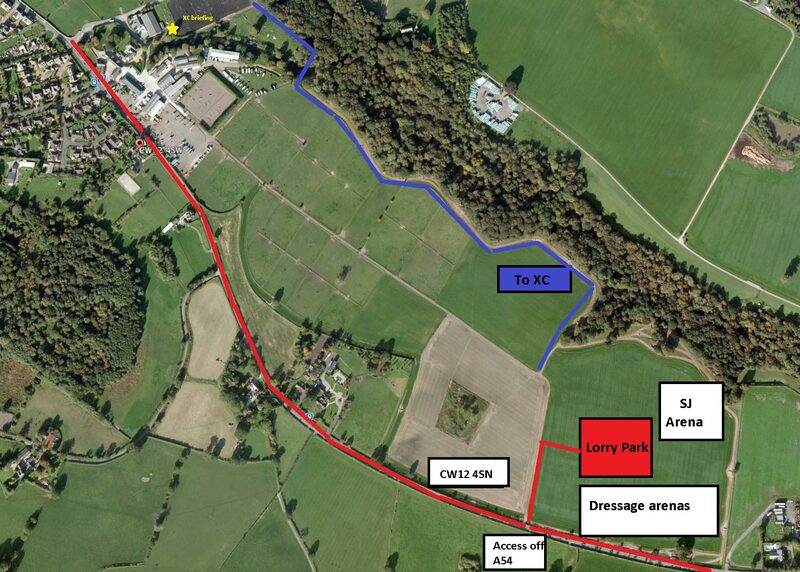 DO NOT TURN INTO THE MAIN ENTRANCE – THERE IS NO VEHICULAR ACCESS TO THE SHOWGROUND. There will be warning signs prior to the entrance so please slow down well before you get to the gate. The A54 is a single carriageway road and although visibility is reasonable you do need to prepare for a 90’ turn. Approaching from the south, from the Congleton direction, the gateway is just over half a mile from the Chelford Road / Sandy Lane off-set crossroads on the right-hand side and again will be signed. The turn in will be a little easier but you will have to look out for oncoming traffic. All normal facilities will be provided (Public catering/Toilets/Vet/Paramedic etc.) but there will NOT be a farrier on site. A draft timetable is set out below for guidance. All classes will start with Area 5 teams followed by Area 5 individuals, then Area 4 teams and Area 4 individuals in that order on the basis of furthest to travel go last where circumstances permit. Dressage A & B 8.30 a.m. – 11.15 a.m. A & B 11.30 a.m.–1.12 p.m. 1.30 p.m. – 2.40 p.m.
Show Jumping 10.10 a.m. – 11.50 a.m. 1.00 p.m.– 2.00 p.m. 2.45 p.m. – 3.15 p.m.
Cross Country 11.30 a.m.– 1.15 p.m. 2.00 p.m.- 3.00 p.m. 3.45 p.m. – 4.15 p.m.